I don’t normally take offense at comedians who are paid to offend. You know what you’re getting into when you listen to them. 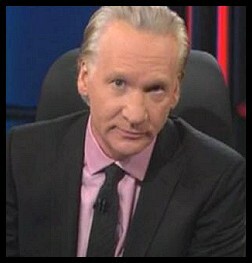 And I generally don’t listen to Maher, because I generally don’t find him funny. But that comment stuck with me, because he’s actually rallying the hordes against the innocent. I went to a congregational meeting on Sunday. We just approved a new budget. This year we raised our giving overseas by $30,000. There’s a program in India that uses English literacy training to give people marketable job skills. They’re helping people climb out of poverty by starting with reading. And in the midst of that, they introduce whoever will listen to the guy who taught us to love people on the other side of the ocean. Religious people in America usually give more to charity than their non-religious peers; we again have raised our giving. And as we pour tens of thousand dollars of our charity into people we’ll never meet, someone tells me that I’m stupid and evil. Last year we made a donation of about the same amount to an orphanage in Haiti that had lost a building to the earthquake. We paid for the whole thing. And the guy living in Haiti at the orphanage leading the build – he’s one of our church members who has moved there to live among and help the poor. I gather that he’s stupid and evil as well. But I can read the history of Christianity and so-called Christians as well as everyone else, and I see in my predecessors what is functionally just the same behaviors you see outside the church. And part of me has to agree – yes, religion, and religious people, are stupid and evil. We always have been. Just like everyone else. Atheistic regimes killed 100,000,000 people in the 20th century. Religious people haven’t done any better with power, just not worse. But here’s the deal – Jesus wasn’t stupid, and he wasn’t evil. If I have to come to grips with my own stupidity and the darkness within my own heart, I start groping around for someone to bail me out. The only person I have ever known who without question has earned the right is Jesus. He isn’t stupid or evil, and only blind stupidity or fiery hatred would make anyone say otherwise. I’ll admit it – I’m stupid and evil. I need a savior. But he’s actually worthy of the title. So the bottom line is that the common thread between stupid and evil religious people and stupid and evil secular people is not religion, it’s humanity. And rather than casting stones at we who have called out to a savior for help, in a century where persecution of Christians is at a historical high, you might just as well have the humility to admit that you need a savior too. Thanks, Jim. This is perfect. It brought tears to my eyes. Amen! The most well-spoken, polite smack down I have ever heard. Thanks for the breath of fresh air in the din of the secular world.